Available in up to a 8 brick LED system in 5000K-70 CRI Cool White (+/- 500K) or 4100K-70 CRI Neutral White color temperatures propagated with LED’s. Consult factory for high CRI (90+) model availability. Available with 100-300V 50/60 Hz Class II power supply. 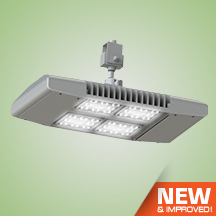 LED’s rated for over 50,000 hours at 25°C ambient temperature. 347V~480V input option available. 0-10V dimming. Built-in surge protection up to 10 kV. Built-in Active PFC Function >95%/Full load. LED Power Supply conforms to UL8750 standards and is IP65 rated for wet locations. A 3/4” hub comes standard for pendant mounting. Fixture may be suspended in structured ceiling applications. LED Power Supply listed for wet locations (IP65). LED bricks ETL listed for wet locations (IP64). Meets US and Canadian safety standards. -40°C to 40°C ambient operation. RoHS Compliant.